The Iowa Tests are achievement tests published by the University of Iowa and are part of the “The Iowa Testing Programs.” The two most commonly-given Iowa Tests are the Iowa Tests of Basic Skills (ITBS) and the Iowa Assessments. Both are achievement tests meaning they assess a child’s knowledge of what they have learned in school and are not cognitive or IQ tests. Despite the name, many states and private schools administer Iowa Tests. TestingMom.com offers a variety of prep materials for the Iowa Tests. What are the Iowa Tests Used for? The Iowa Assessments are frequently used to test for admissions into gifted and talented or accelerated learning programs. They are often used in conjunction with cognitive tests, like the NNAT ® or CogAT ®, to get a complete picture of a student’s accomplishments and potential. Schools may also give a creativity test, such as the Torrance Tests of Creative Thinking ®. 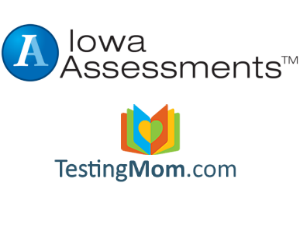 TestingMom.com offers a variety of prep materials for the Iowa Assessments and the other assessments listed here. Start preparing now with 100 free questions. What is the difference between the Iowa Assessments and ITBS Test? The Iowa Assessments were released in 2012 as a replacement for the Iowa Tests of Basic Skills. The Iowa Assessments were created to sync with Common Core State Standards and, beginning at the 6th-grade level, assess college and career readiness. The Iowa Assessments can be given via paper/pencil where the student will either answer in separate booklet or directly on the test. The test can also be administered online. The method of administration varies from school to school. Be sure to check with your child’s school to find out how they will be giving the test. The Iowa Tests of Basic Skills are not aligned with Common Core and only go through the 8th grade (level 14). Even though there have been no updated versions of the ITBS released since approximately 2011, the test is still being published and is in use today by many school districts across the country. Both the Iowa Test of Basic Skills and Iowa Assessments are designed to assess what a student has learned in school. The Iowa Assessments are aligned with Common Core standards, but the ITBS is not. Despite this, the ITBS is still frequently used as an admissions test for Gifted and Talented programs across the US. Iowa Test levels 5-8 are administered to students from Kindergarten through 2nd grade, while levels 9-14 are given to students from 3rd to 8th grade. Each Iowa Test level consists of a series of subtests that are administered in sections by content. The ITBS was the original Iowa Achievement Test. It was developed in 1935 and was originally called “Iowa Every Pupil Test of Basic Skills.” Over 80 years later, more-recent editions of the ITBS are still being used today as a tool to monitor and track student progress over time. Homeschooling families can also use the Iowa Assessments and the ITBS to confirm a child’s learning progress, since the test is sufficient to meet state homeschooling requirements. What Material is on the Iowa Test and ITBS? The tests are written in levels 5-14. You will see below that there is some overlap between the different levels of the test. What Time of Year is Each Level Given and to What Grade Levels? TOTALS – COMPLETE 146 2 hr. 30 min. TOTALS – COMPLETE 187 2 hr. 40 min. TOTALS – COMPLETE 278 4 hr. 10 min. TOTALS – CORE 220 3 hr. 20 min. TOTALS – COMPLETE 297 4 hr. 10 min. TOTALS – CORE 239 3 hr. 20 min. Hi, the father of a student who attends gymnastics school in Dallas has asked me (a retired certified teacher) to administer the ITBS to his daughter. Do you know if I’m able to do this? And how I would go about getting a copy of the test. The child is not homeschooled; she attends school w/ 1 teacher and 7 other gymnasts on the floor above the gymnasium where she practices 7 hours a day. Is the math section of 3rd grade ITBS based on common core? For second grade level 8 Iowa test should we also be preparing on third grade iowa test materials since there is a overlap of grades in this level? I think it’s great, but, I think you should add a level 12 test timing per section part, I would really like to know how long my son will be taking the test for.